The imagination of a young kid is a formidable force. It can turn laundry baskets into spaceships, design a skyscraper out of a pile of plastic bricks, it can even propel an ancient old man and his reindeer through the Christmas Eve sky. Kids can become fascinated with the most unsuspected things, and when a parent facilitates that fixation, amazing things can happen. Patch Hurty is six, and favorite thing isn’t all that different from likely millions of other six-year-old boys. Patch loves cars. In fact, some of the first words Patch ever learned to read were the names of different cars and their makers. When he stumbled upon a Ford emblem that had shaken loose from a passing car near his house, his eyes lit up, and an obsession was born. 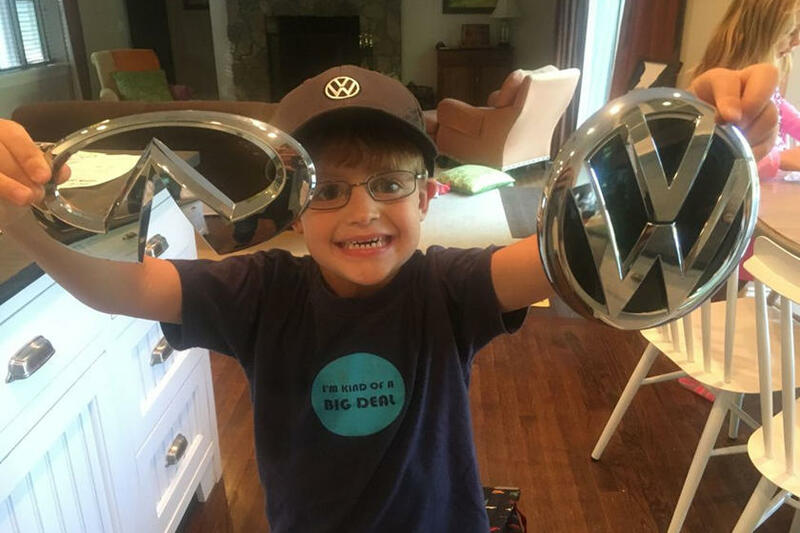 Patch, then five-years-old, began a mission to start a collection of shiny new car badges. But, without turning to a life of crime and defacing the cars in his neighborhood and nearby parking lots, how would the little Connecticuter source the emblems? Thankfully, Patch has a great mom, Lindsay, who has probably endured many a car-ride fillibuster about literally everything to do with cars, yet she still desires to nurture his passion for automobiles. Lindsay and Patch hatched a plan to go straight to the source: the auto manufacturers. They sat down with pen and paper and crafted a simple pitch to send to every car maker they could think of, essentially asking if they could spare an emblem, a sticker, anything from their brand to add to Patch’s collection. After sending letters to more than 50 different companies, the Hurtys began getting responses that simply blew them away. The response from various car makers was overwhelming. Volvo sent Patch a full-size grille badge and several other treats. While Jeep couldn’t send a badge, they did send the little guy a metal sign, a hat, a pen, and a keychain. Moving onto luxury vehicles, Patch received the center cap from a Bentley steering wheel. BMW sent a brand new emblem along with a personal letter. A handwritten card from Honda read, “We hope your love of cars continues to grow.” Bentley thanked the little guy for sharing his love of cars with them. Nine people over at Infiniti signed their handwritten card to Patch. Tesla, Bugatti, and dozens of other car makers were happy to oblige Patch. Lincoln even sent an original pencil sketch of their classic Continental. Patch surely wasn’t expecting such an outpouring of generosity, but he got it! Now that Patch has had such a wonderful experience at such a young age with so many different auto manufacturers, asked the boy who he’ll pick when the time comes for him to buy his first car. The post When This Car-Obsessed 6-Year-Old Reached Out to Car Companies to Help Him With His New Hobby, His Family Never Dreamed What Would Happen Next appeared first on Flag And Cross.